Industrial production in EMU is looking very weak. It is fair to say that no matter how you look at it, it is exceptionally weak. In April as well as over three-months there are output declines in all sectors. Of the eleven EMU countries detailed in the table eight show output declines in April and only one shows an output increase over three months. Sequential growth rates find growth rates are eroding and over three months they are showing net declines for all sectors. Of the eleven EMU nations detailed in the table all but three also have sequentially eroding rates of growth- growth that is weaker over six month than over 12-months and growth that is weaker over three-months than over six months. . Weakness in IP is simply extremely widespread and the rate of the decline has become worrisome. 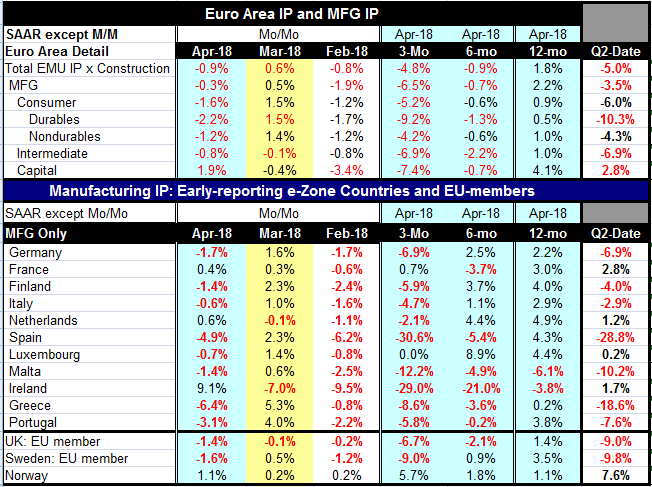 While IP is still up by 1.8% Year-on-year it is falling at a 4.8% annualized rate in EMU over three-months. We have seen declines in German IP and in in real orders as well. The Markit PMIs are showing weakness in EMU and weakness sprinkled among its largest economies. Interestingly, there has been a bit more weakness in the services sector than in the manufacturing sector in the Markit framework. Germany’s Zew experts have been cutting their outlook and they hold rather poor outlooks for EMU, the UK, the US and Japan. The weakness is not just in Europe. Having said that, the Fed is still on the warpath to raise rates and there will be repercussions for Europe from that. The Fed is worried that when the next recession comes it will not have enough fire power to assist a weakening economy. It is clearly skeptical of using QE again and is trying to elevate interest rates. It is also in the process of evaluating the inflation risk the from its labor market that is in some ways tight (unemployment rate) and in other ways loose (participation rate) and in any case not generating much wage pressure. While policymaking at the Fed like policymaking in the White House seems to be less concerned about international repercussions from policy intended to help the US economy the fact of the dollar as the principal reserve asset and of so many commodities being priced in dollars means that the knock-on effects will still be there. How much US policymaking is affecting Europe is a good question. Is the slowdown a reaction to concerns over possible trade actions (and any reactions) or is Europe having a natural slowdown after its speed up of last year? And if this is ‘natural’ why is the economy slowing so abruptly? Or are these reactions to uncertainty stemming from Brexit, Italy’s Five Star Movement and even a changed government in Spain? We still can’t be sure of what is going on or even of what is affecting growth. We will soon see if all this slowing and uncertainty impacts ECB policy at all.